Matrix Search Professional Transit-Progression Report Program! Matrix has always been known for the power and sophistication of our search programs, but this time Stephen (Erlewine) has outdone himself. This new program is, by unanimous agreement, the most powerful search program ever available to astrologers. 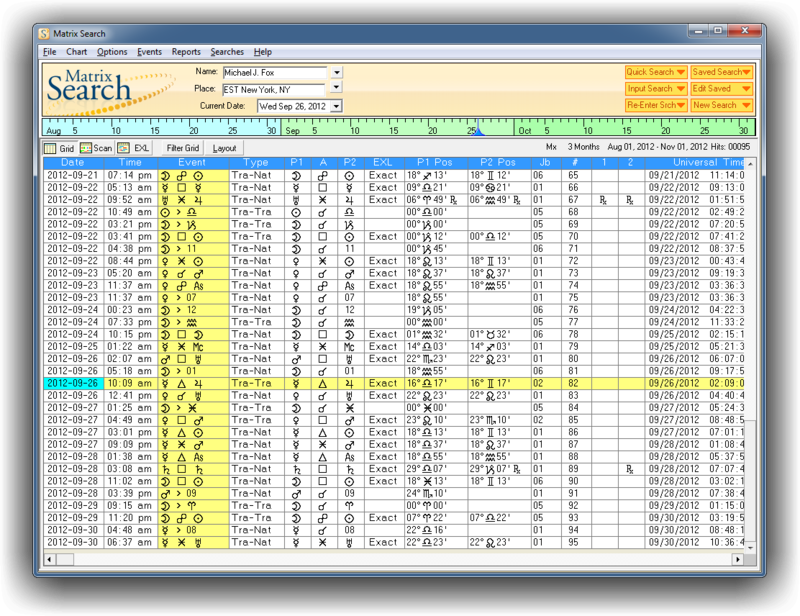 Add any planet, object, or point in the universe to your searches – built into the program are standard points, including Zodiac Point, Eclipse or Lunation before birth, Arabic Parts, Fixed Stars, Astro Expression, Synodic Point, Natal chart points, Natal Cusps. But, you can go where no astrologer has gone before and add absolutely any object or point you consider significant. 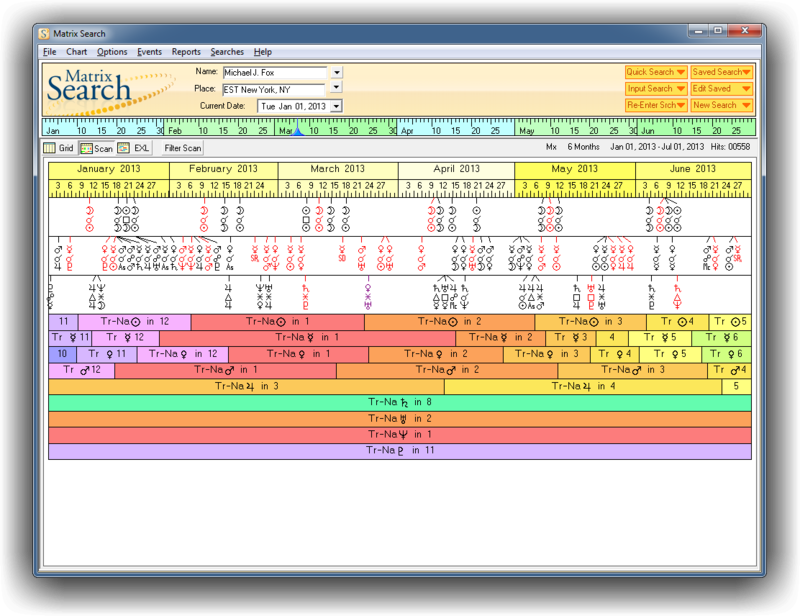 Matrix Search software's flexible display lets you view your searches as a scan – click and zoom, or as a list, click and instantly pop-up a chart of that event; see all of the influences at play in a given moment. Sorts and Filters are the key to any search, especially when you can produce life scans that may contain up to 32,000 hits. 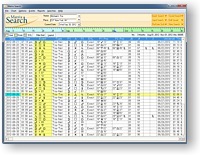 Matrix Search software lets you sort, sift, and filter your results so that you can focus on exactly what you are looking for, and see what is important. One-Click Select searches are pre-programmed for 1 and 3 days; 1 and 2 weeks; 1, 2, 3, and 6 months; 1, 2, 3, 4, 5, 10, 15, 20, 25, 30, 60, and 90 years. Or select the exact length of your search. Life-Time scans/searches are perhaps one of the most interesting and exciting things you can view, and share with a client. 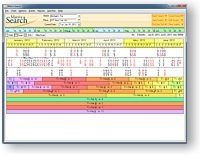 What you see with Matrix Search software you determine. Some of the One-Click instant views include Lunations, Eclipses, Lunar Phases, Void of Course Moon, Stations, Sign Ingresses, House Ingresses, Equinoxes and Solstices, Synodic Cycles, Aspect, Aspect Combinations, Chart Patterns, Moon Apogees and Perigees, Lunar Days. All program output is in convenient PDF format for easy saving, printing, and e-mailing. Matrix Search requires a computer with Windows 7, 8, or 10. With 32 MB RAM memory or more, and 80 Mb hard disk space. Also compatible with either 32 bit or 64 bit operating system. 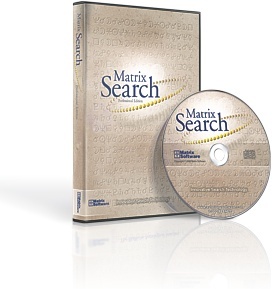 Matrix Search also runs on Mac computers with Windows Operating System installed.